The channel strip that always works. Take any track, any bus or any mix - the Summit Audio Grand Channel always sounds right. The Grand Channel combines the warm and smooth tone sculpting EQF-100 passive equalizer with the rich sounding and dead-easy-to-use TLA-100A compressor. 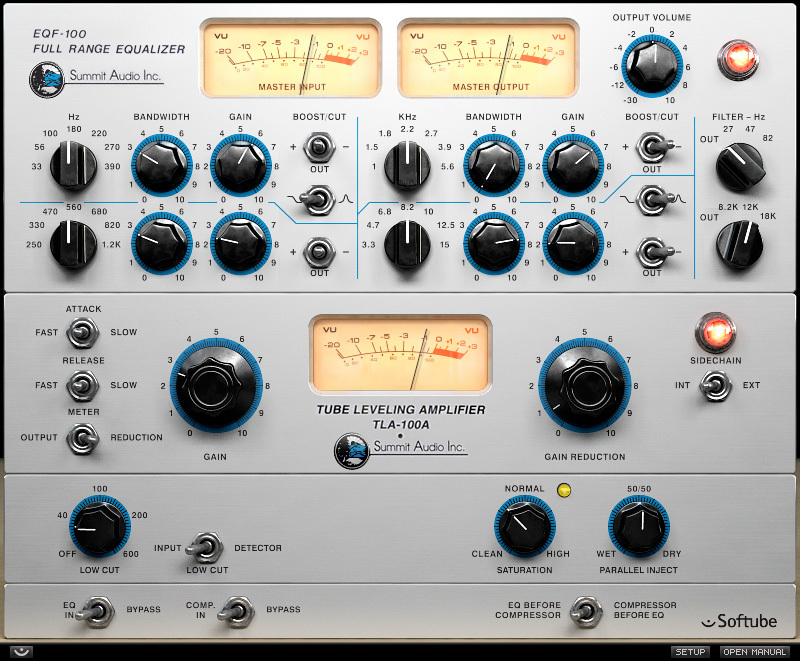 As a modern addition to the classic TLA-100A, the plug-in also includes Parallel Compression, Saturation Control and Low Cut Filtering on input or detector. These two pieces of classic Summit Audio gear are what professional sound engineers have used for more than two decades to make their mixes sound just right. When the EQF-100 and TLA-100A were designed, Summit Audio made sure to combine the finest of what vintage tube designs had to offer with a modern sense of how these units should stand the test of time. The result was remarkable, and today you can experience the Summit Audio grandeur in digital form, just reach for the Grand Channel! Easy user interface with four panels. One equalizer unit, one compressor unit expanded with controls for saturation, low cut and parallel compression, and finally a signal routing panel. Use the smooth and flexible Summit Audio EQF-100 for your equalizing needs. Features four bands of equalization, low and high cut filters and modeled output distortion. More info about the Summit Audio EQF-100. The dead easy and smooth one-knob Summit Audio TLA-100A compressor. It's the "set-and-forget" compressor and has been around for over a quarter of a century. The original design has been expanded with an additional panel featuring controls for sidechain filtering, saturation and parallel compression. More info about the Summit Audio TLA-100A. Bypass any unit to save CPU. Route the EQ before the compressor (the old school way) or the other way around (modern). Extremely analog behavior of frequencies, phase, distortion, attack, release, etc. Mac OS X 10.9 or newer. Windows 64-bit, versions 8 or 10. We have not qualified our plug-ins for Windows 10 Anniversary Edition. Broadband internet access for downloading installer and registering licenses. All Softube plug-ins support both 32- and 64-bit hosts, although a 64-bit OS is required. Supported sample rates: 44.1, 48, 88.2, 96, 176.4 and 192 kHz, in both mono and stereo.